The SS Java left London 12 October 1839, stopping at Plymouth on 28 October 1839 to pick up passengers before sailing for the settlement of Holdfast Bay, South Australia, where it arrived on 6 February 1840. The Holdfast Bay settlement was the name given to the settlement at Adelaide. On board where some 500 passengers, 60% of whom were Cornish and 13% from Devon. They were the Cornish contingent in the first settlement of South Australia. The free settlement of South Australia was widely advertised in Cornwall and attracted 941 applications from families representing a far greater number. 500 were accepted - this was the first 150+ of the 500 applications approved. It was a farming/tradesman contingent - all were supposed to be under the age of 30 although this was not always the case. Extracted from the Journal of a passenger. William Richards' journal records the voyage to South Australia from Plymouth to Adelaide in the 'Java', a voyage of 98 Days. The journal itself is reasonably brief, of three handwritten pages, but yields a confronting insight into life on-board emigrant ships. One of the most interesting details is the number of deaths recorded throughout the three month voyage. Richards counted 28 child deaths including his young daughter Caroline, 1 still born child and 4 adult deaths. He also explained that more child passengers perished in the weeks after landing mainly due to the effects of starvation on the voyage. After being on land for a while, Richards recorded 6 other ships had arrived with passengers and crew reporting fair treatment and no deaths on-board at all. One can imagine the frustration and sense of unfairness felt by those who survived the voyage on the 'horrid' Java. There are varying accounts of the number of deaths aboard the 'Java' during this voyage. Java - The Melancholy True Story of the EastIndiaman Java by Stephen Barrett, details one such account, where he writes of the infamous trip to Adelaide from London and Plymouth between October 1839 and February 1840 during which some 50 of the 500 passengers on board starved to death. These included cabin and intermediate passengers, as well as assisted emigrants. A Royal Commission into the affair was held, and her owners, Scott & Co. of London were ordered not to be paid. There was widespread disgust in the South Australian papers of the day and a Medical Board of Enquiry was held. This was conducted over 12 days in February and found that food had been wasted in the early days of the voyage. Official blame was placed on Surgeon Superintendent Martin appointed by the Colonization Commissioners. The captain, Alexander Duthie, was absolved of blame despite his negligent attitude towards the passengers. What became of the 'Java'? The 'Java' remained in service as a passenger ship and later, a troop ship for some years before being converted to a coal hulk (used to provide coal to more modern steam ships). 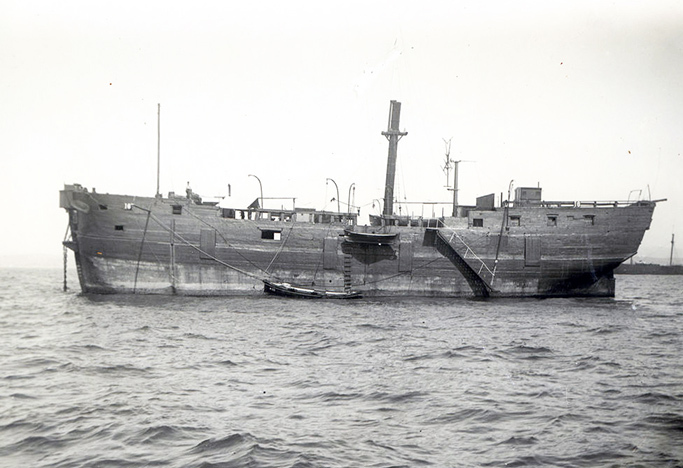 She was eventually laid up in Gibraltar where she was anchored for the most part of 80 years before being towed to Genoa to be scrapped in 1939. It is said that the 'Java' became almost as famous as a landmark as the Rock of Gibraltar because it was there for such a long time. The photograph below shows her anchored there. Editor's note: It is remarkable to think that the Java was still afloat in 1939 when in 1839, carpenter's reports indicated that some of her timbers were so rotten, they couldn't hold nails! She was towed away for scrap because the authorities didn't think she could stand up to another winter storm. The following pages are a transcript of the diary of William Richards, reproduced with full copyright acknowledgement to the State Library of South Australia.